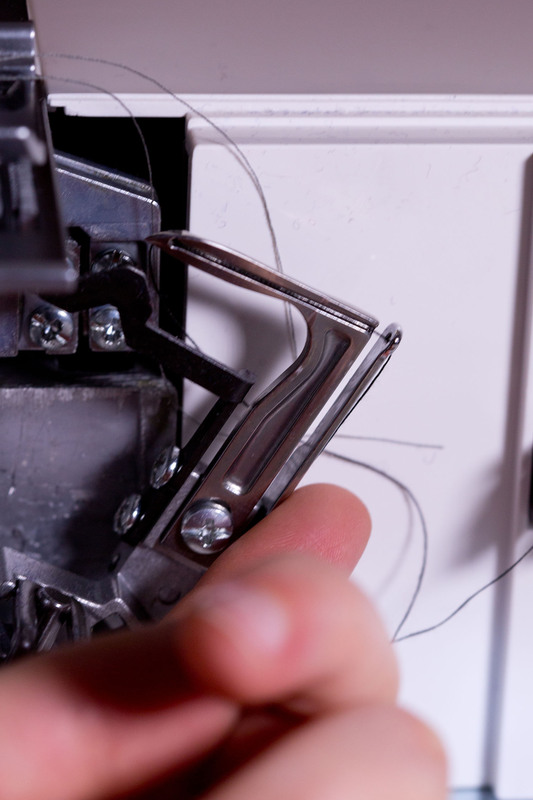 Long story short: my nine year old Babylock Evolve – a combination serger/coverstitch machine – broke on me one too many times. (This time the selector cam – which allows you to engage/disengage the upper looper – broke off and went missing. So now I can no longer convert between serging and coverstitch.) The dealer I bought it from – a local Babylock dealer that was an easy 15 minute drive away – has since gone out of business. My regular sewing machine repair guy took a look at it, told me what the problem was, and then said it was something he didn’t want to take on. He told me “either talk to Babylock about your options, or consider replacing it.” My dealer has always been honest and straightforward with me, so that combined with the fact that I was beyond annoyed with this machine at this point meant that I took his suggestion seriously. Two separate machines rather than a combination. My father the mechanic has always told me that when given the choice between two machines that each do one task and one machine that does two tasks, go with two machines. Not only are dedicated machines probably better at what they do, but as I’ve found out less complex = less things to break. Janome brand. My regular repair guy is a small Janome dealer. I love my dealer (he’s been nothing but fair and extremely patient with me) so I knew I was going to buy from him rather than online or from another dealer in the state. Convenient dealer support is extremely important to me. My dealer is a short drive from work, so if I need to go there for something it is easy to stop by during lunch. I also love how normal turn-around time for repairs is only 1-2 days. Excellent with knits. My new serger would be used primarily for knit construction. I have a Janome MyLock 204D. This machine is a little workhorse that very compact and great for finishing woven seam allowances (which is why I leave it set up next to my regular sewing machine), but it is lackluster when it comes to handling finer knits. Automatic tension. This is something I truly loved about my Babylock. As a beginner I really struggled with adjusting the tension on my MyLock 204D. (Now that I’m more experienced I find it easier to use.) I find the automatic tension is particularly useful when it comes to sewing knits. I found the manual and DVD included with the 1100D spartan and quite underwhelming. The information is there, but it is presented in a very minimalistic fashion. When it comes to organization, amount of information, and general presentation Babylock definitely has the edge. The DVD is also disappointing. It shows you how to thread, and that’s about it! I also had trouble playing it on my (older) Mac laptop. Neither of these bother me because I’m experienced with sergers and sewing in general, and I prefer to be a self-learner. If you’re a beginner and/or not comfortable with figuring things out on your own, I highly recommend buying this machine from a dealership with a good support system. 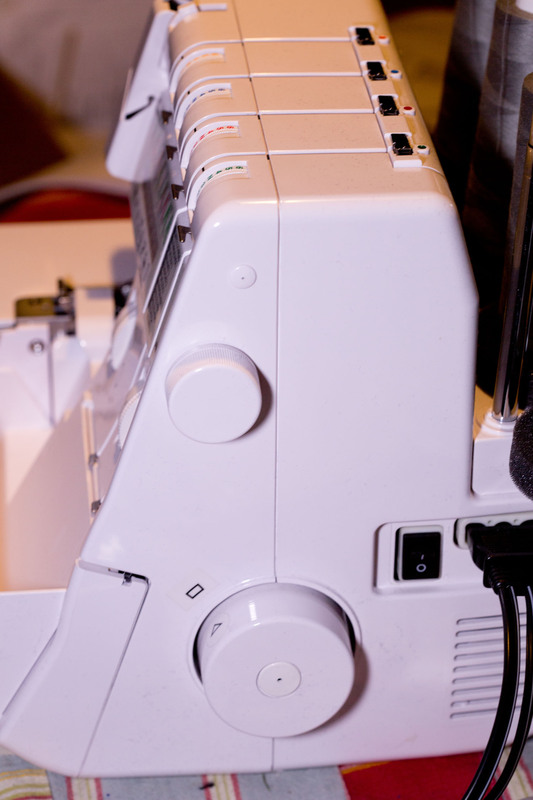 The Janome 1100D is a stand-alone serger. 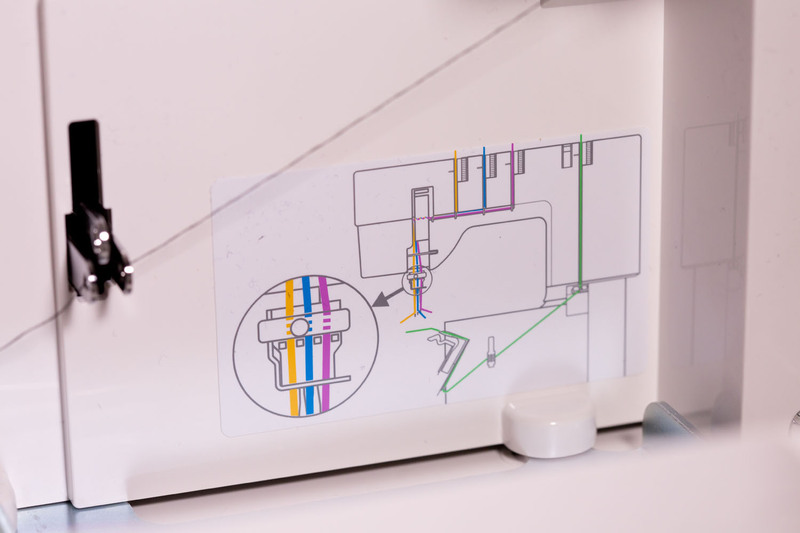 I believe this and the 1200D are the only two sergers in the Janome lineup with automatic tension. I’m not sure when this machine came out, but I know it has been around for a few years now. In addition to coming with all of the normal serger accessories (needles, threader, screwdrivers, tweezers, spool holders, a brush, etc) it also came with a waste catcher that kind of hooks on the front. You need to take it off when rethreading the machine, but holds a good amount of clippings and actually does catch most of the little bits serged off. The 1100D has a small traditional bulb for light. For this photo I turned off all the lights in the room and tried my best to capture how the light looks in person. You turn a dial on the right side of the machine until your selected program comes up. The smaller dial on the top is what you turn to select the program you want. 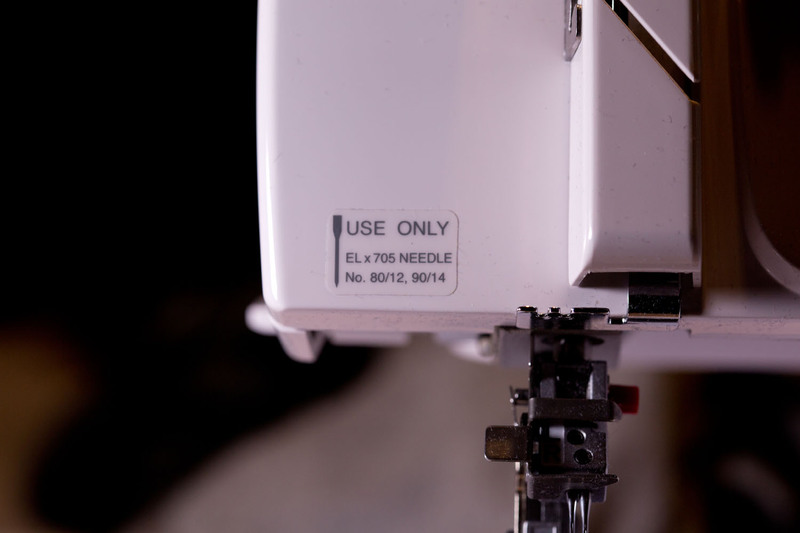 When the program comes up it tells you which needle(s) to thread, the suggested differential feed/width/stitch length, if your 2-thread converter, knife, and chaining finger should be engaged or not. 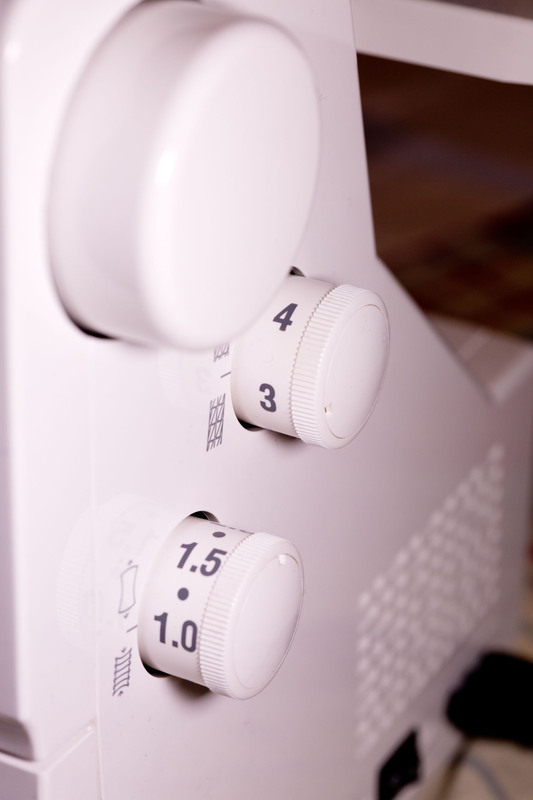 If you find the automatic tension isn’t behaving as well as it should, you can also adjust the top dials for further control. I find this system more intuitive than the A-B-C-D stitch selector lever on the Evolve. Before you thread the machine you turn the handwheel and match the triangle on the handwheel to the square on the side of the machine, which raises the needles to their highest position. I really like how Janome included these markings, as they take the guesswork out of making sure the needles are raised as high as they will go. Such as simple feature that makes life a little easier. After you thread the machine (making sure the thread is firmly in the tension discs!) the instructions suggest hitting the tension release lever at the top and pulling all the threads for about 4″. Sometimes I do this and sometimes I do not. If I do it I give the threads each a good tug afterward to make sure they are firmly wedged in the tension discs. I should note that unlike with my Babylock, lifting the presser foot on the 1100D does not automatically release the tension. 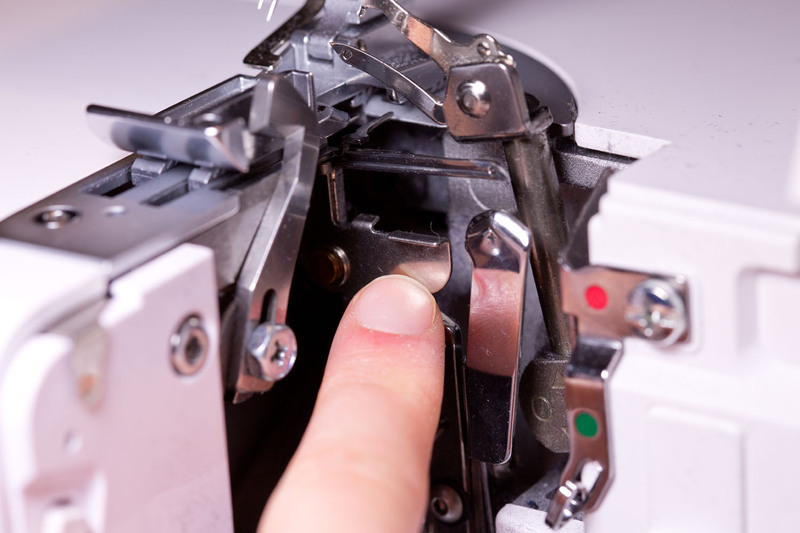 If you want to release the tension you need to pull on the tension release lever, which is positioned at the top of the machine above the two needles. I found this very weird at first, but after the first day I got used to it. Like my Babylock Evolve, the 1100D takes ELx705 system needles, size 80/12 or 90/14. (The CoverPro 2000CPX also takes the same needles.) I still have a huge bundle of these from an AllBrands order I placed over three years ago. I found this a much more useful feature than the Babylock’s jet air threading ever was. One thing I want to note about threading the left needle: there’s two thread guides/bars directly above the needles. The manual tells you to pull both threads through both guides. For the right needle I used both guides. But for the left needle, my repair guy suggested that I skip the second guide (the one closest to the needles) and put the thread directly into the needle. It has no effect on the quality of the stitch, but it seems like the threads got less tangled this way. I forced myself to thread this machine about five times in a row, cutting the threads after sewing a sample and starting fresh each time. (It brought me back to my days as a musician when I would practice one or two measures over and over again, in order to reinforce muscle memory.) When you’re learning how to thread any new sewing machine I suggest threading it maybe five to ten times in a row for this very reason. Do this before you start working on a project, so that if you need to rethread for some reason during the project it will be a minor annoyance rather than something that causes your progress to come to a screeching halt. Overall I found this machine is a little easier to thread than my MyLock 204D, especially when it comes to the lower looper. The lower looper on the 1100D has a switch which puts one of the guides in a much easier position to reach after you press down on it. 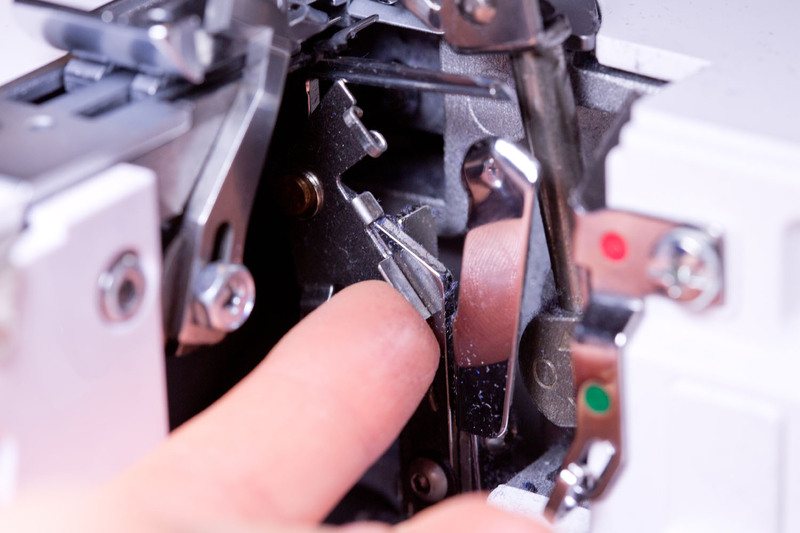 After you thread the lower looper you just push the this little metal tab up to put everything back in place. I have mixed feelings about the thread guide pole. I appreciate the solid sheet of metal rather than the bent metal loops of the Evolve. 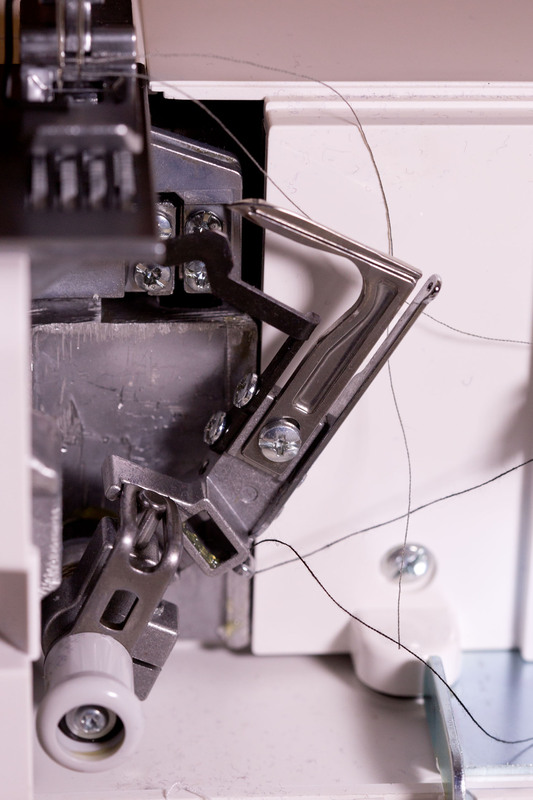 But I also prefer how the Evolve’s thread guide was firmly attached to the machine. The 1100D thread guide just pushes in. When you pull the pole up you need to hold it at the base when raising the guides, or else it pulls out entirely. 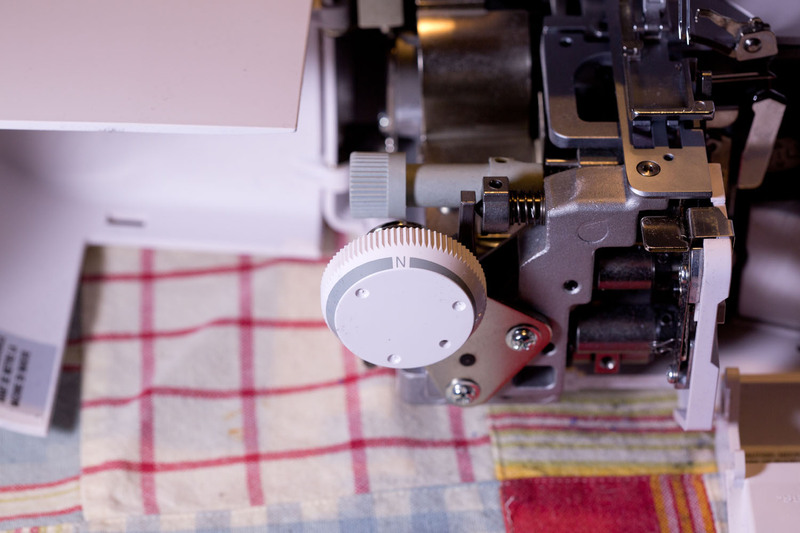 As with all other sergers, the manual recommends starting a freshly threaded serger with a piece of fabric under the foot, turning the handwheel for a few stitches to make sure everything looks good, and then at that point using the presser foot to sew. So far I have found this machine to be a little pickier than the Babylock when it comes to observing that process. The 1100D is also pickier when it comes to chaining off at the end. I’ve noticed I get the best results when I chain off with more rather than less speed. One quirk about the 1100D is that you lift the presser foot lever up in order to lower the presser foot, and pull it down in order to raise it. Weird, right? This is completely opposite of every machine I’ve encountered so far, and something I am glad the training person at the sewing machine place showed it to me before I took it home. I’ve since adjusted it it. I feel so-so about the stitch width dial. I like the location, which is all the way to the left of the machine. As a beginner I sometimes got confused between the stitch width and length dials on my Evolve, which are right next to each other. 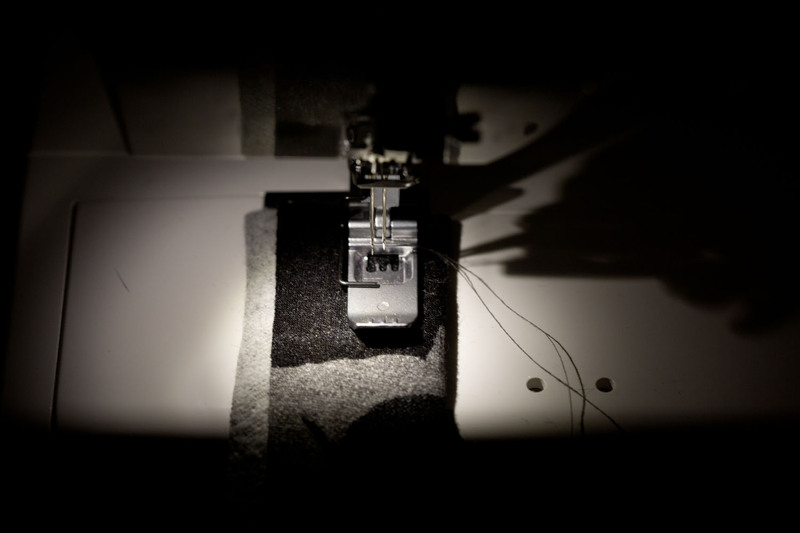 However, it does not turn as easily as the stitch width did on the Evolve. I would also prefer that it was numbered evenly like the Evolve’s was. 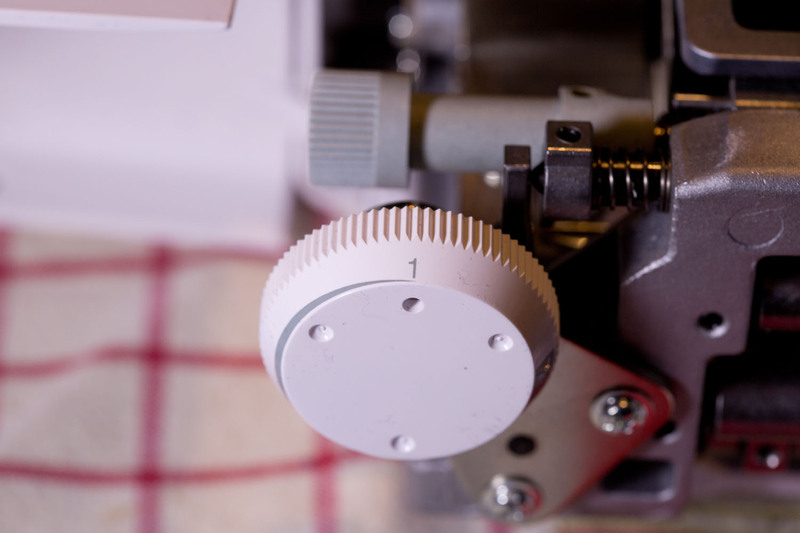 This dial has 1 on one side, 7 on the other, with N (neutral or 1/4″ width) being in the middle. No numbers between. I have not needed to adjust the presser foot pressure yet. The presser foot pressure knob for both my Babylock Evolve and MyLock 204D don’t have any numbers. This one has numbers 4, 5, and 6. It turns very stiffly. On page 62 the manual shows you how to lock the knife position in place. I don’t think either my Evolve or 204D have this. This is something you want to only do if you’re working with very heavy fabrics, like multiple layers of thick sweatshirt fleece or a bulky sweater knit. 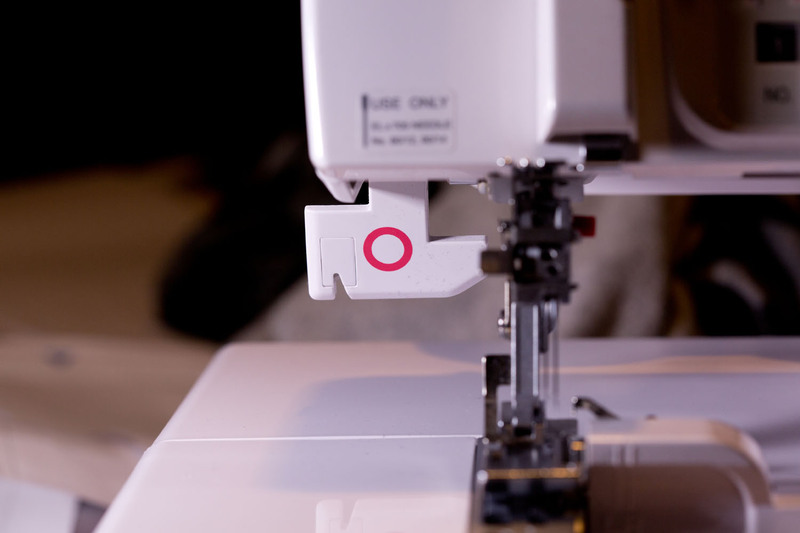 You’re instructed to unlock it as soon as you’re done serging the heavy fabric. Right off the bat both my dad said “wow, that machine runs really smooth compared to your old one.” Men and their obsession with motors! It is true though. I have found very little difference between the actual stitch quality of this and the Babylock Evolve. This really surprised me, as I’ve heard nothing but gushing about how Babylock serger stitch quality is “the best”. I rarely do things like flatlocking or narrow/rolled hems on my serger. I did some samples the day after I got this machine, and in my opinion they were pretty much identical to what my Babylock Evolve produced. One thing I preferred about the Babylock is the shape of the presser foot was better for attaching clear elastic. 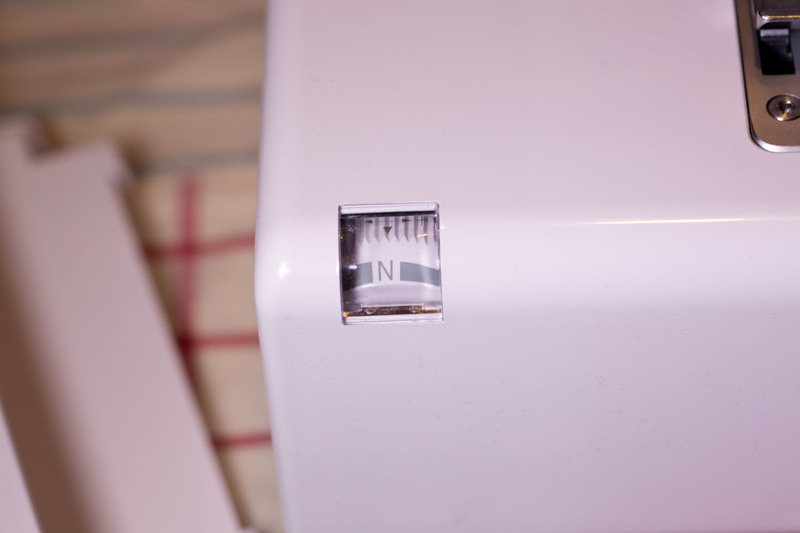 The Janome doesn’t have that, which makes applying clear elastic more difficult. 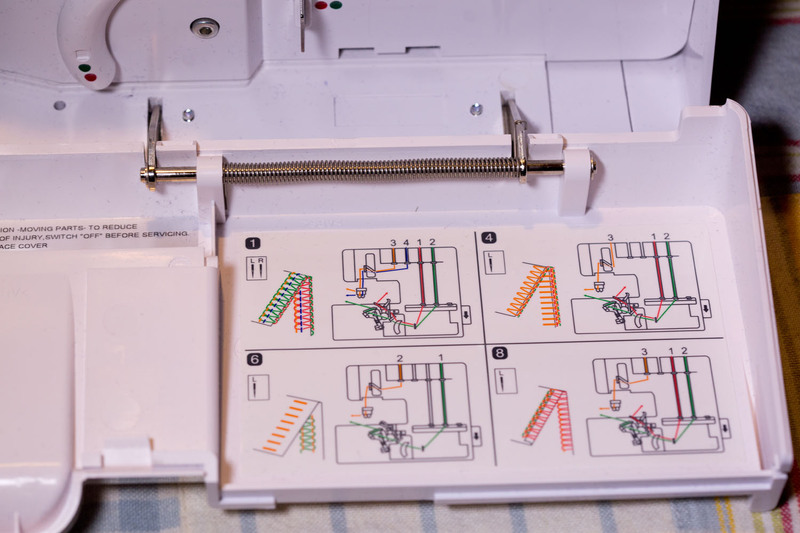 Once again, I found the instruction manual extremely minimal, so if you’re completely new to coverstitch machines I recommend buying from a dealer with a good instructor that can show you the ropes. If you’re more of a self-learner then I recommend checking out the Janome Inspirations CoverPro video below. It is only ten minutes long, but she packs in a lot of information into those ten minutes. 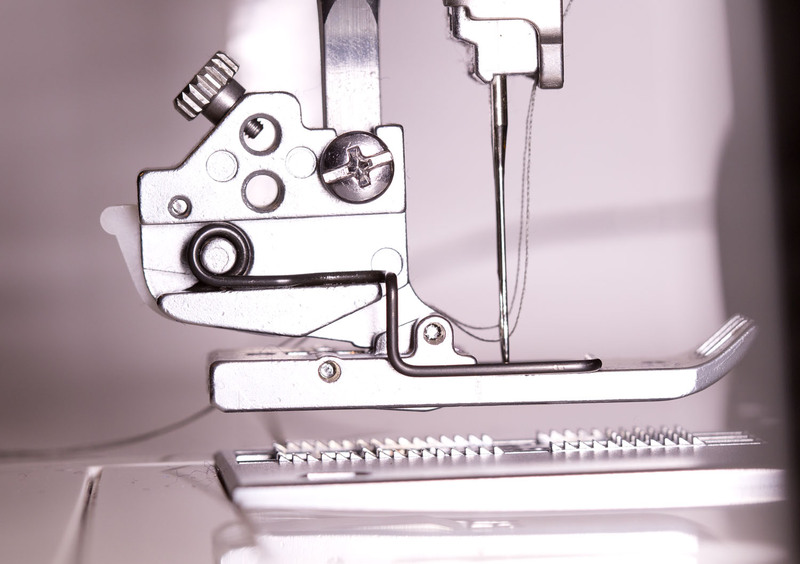 The 2000CPX is a standalone 4-thread coverstitch machine. You can do two and three needle coverstitching as well as single needle chainstitching. 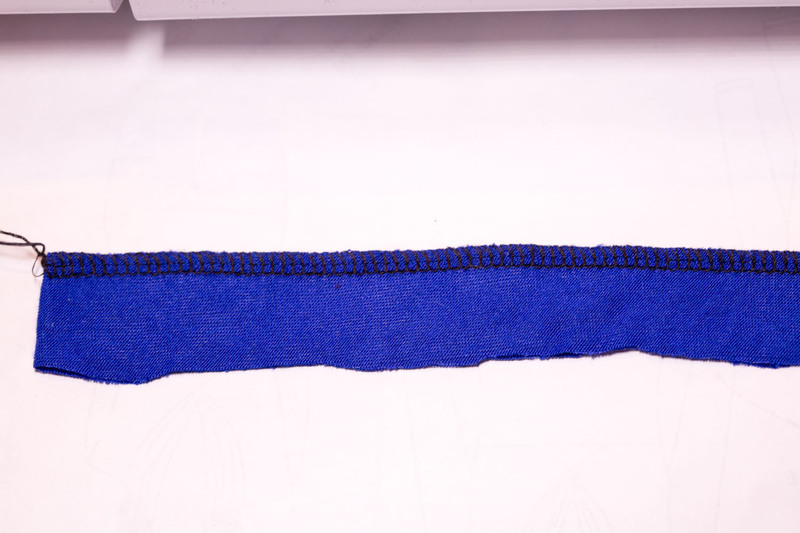 In addition to being useful as a topstitch for bindings, the chain stitch is also great for basting. Just hold the top thread, then pull the bottom thread, and everything comes undone in an instant! Going from a combo machine to a dedicated coverstitch, the first thing I noticed was just how much larger the bed of the dedicated coverstitch is. 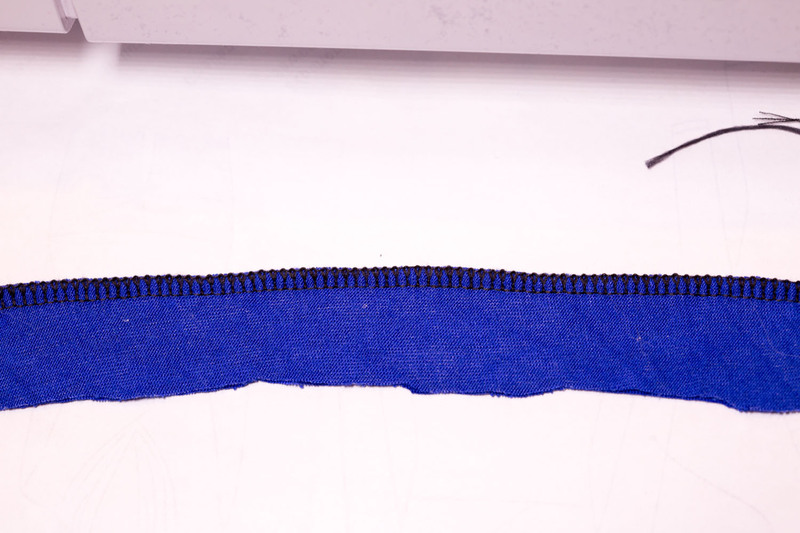 It allows much more room for manipulation if you plan on using it for basting or decorative topstitching. I didn’t mind switching between overlock and coverstitch, but I did mind the limited space for coverstitching. For me this is the biggest benefit to having a dedicated coverstitch. The 2000CPX differential feed and stitch length dials are on the right. Little diagrams help you distinguish between the two. 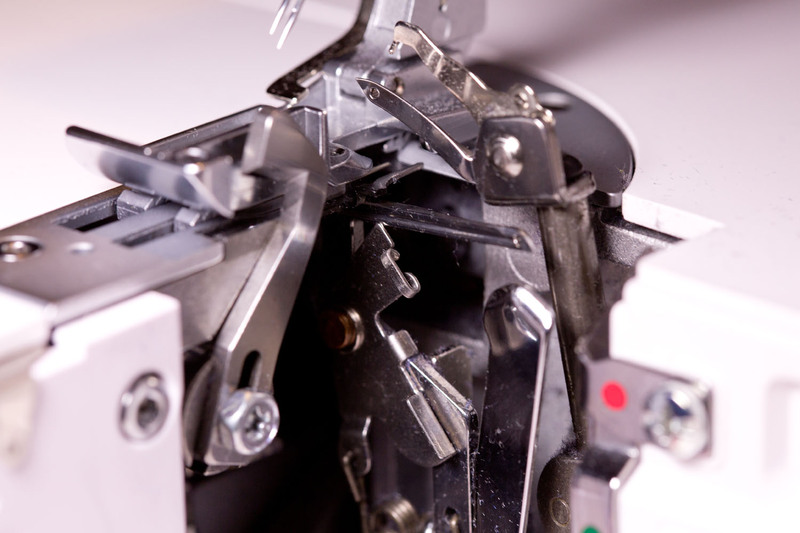 The presser foot pressure is controlled by a knob on the top left of the machine. 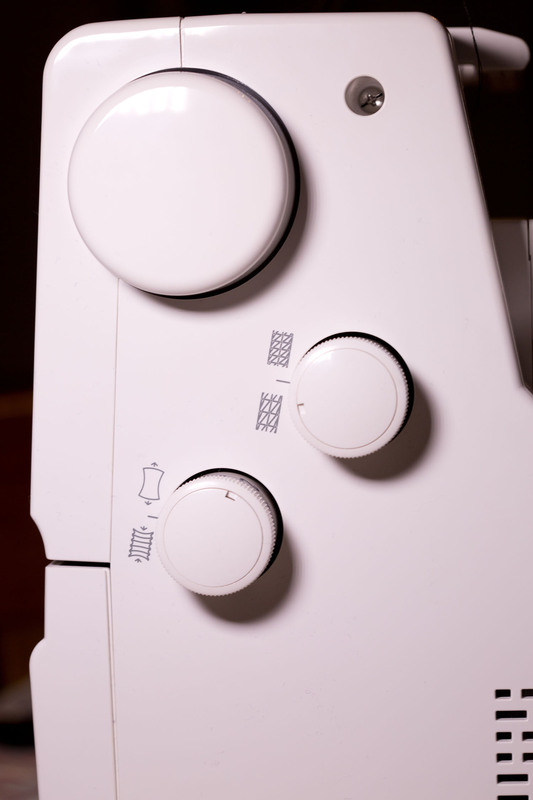 The tension controls, along with the looper thread tension switching lever (that “soft” and “tight” switch), are all positioned on the upper section of the machine. Most of the time you’re probably going to leave the looper tension adjustment switch on “tight”. You would switch it to “soft” if you’re getting tunneling, and back to “tight” if you’re getting skipped stitches or the looper thread is too loose. Inside the front cover there’s a handy little quick reference of suggested tensions for each stitch. The 2000CPX is a new model – I believe it came out in early 2015. 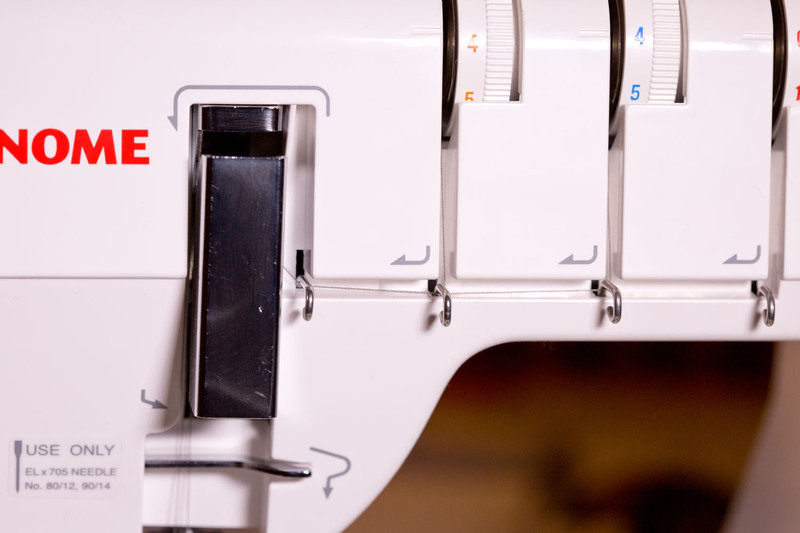 From what I understand, the main difference between the 1000CPX and 2000CPX is that the 2000CPX includes an additional tension setting that helps you either tighten the back stitches if the machine is skipping stitches, or loosen them if you’re experiencing tunneling. The 2000CPX seems to have differently shaped arm/bed (more squared-off than the 1000CPX). The 2000CPX also has a little LED light instead of a regular bulb. Once again I turned off all the lights in the room so you could get an idea of the strength and spread of the light. Since there was not much of a price difference between the two (around $100?) I decided to go with the 2000CPX for the additional tension control. I found threading on this to be straightforward. There’s diagrams and arrows everywhere! After you finish threading the lower looper, just push the looper to the left. After it clicks into place you’re ready to thread your needle(s). In my opinion the Janome actually does a better job with tension than the Babylock, especially for the chain stitch. I used to also have problems with the Babylock’s wide coverstitch being slightly tunneled. This hasn’t been an issue with the Janome. Despite sticking to Babylock’s suggestion of ELx705 CF needles, I would have problems with skipped stitches (especially on finer knits) unless I used wooly nylon in the lower looper. With the 2000CPX I can serge with regular Maxi-lock thread in the lower looper and not have skipped stitches. Right away I noticed the difference when it came to sewing over serged seams. Instead of getting “stuck” like the Babylock did, which would result in tiny little uneven stitches and the stitching going crooked, it just sews over them nice and straight. I don’t have to clip the serged seam or anything! It just works. For bulkier knits I do stop and make sure everything is aligned properly and the presser foot lip in the front is properly placed before going over the seam. 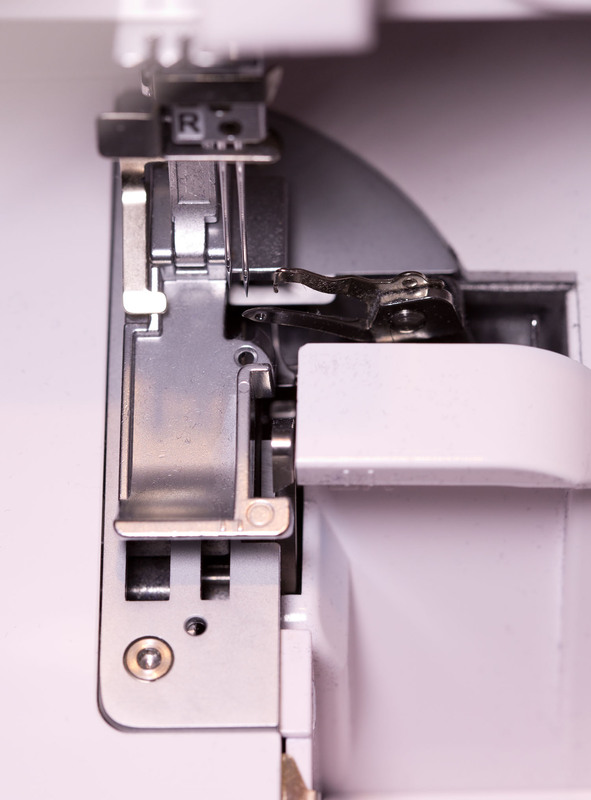 In case if you’re wondering, I haven’t noticed a difference between the presser foot clearance on the Janome 2000CPX and Babylock Evolve. The second major difference was starting/ending in the round, which is the vast majority of my coverstitching. I printed out Debbie Cook’s coverstitching tutorial on ending a coverstitch and tried doing it many times with not much success. The Babylock seemed very picky about the position of the needle height, so most of the time I couldn’t get the tension to release properly on the first try. I would dread when it came time to end the stitching. Since I almost never succeeded at getting the threads to pull out to the back, I resorted to leaving a long tail, taking a hand sewing needle, and carefully pulling them to the back by hand (where I would then tie them off). If I wasn’t careful the stitches would start to come undone. 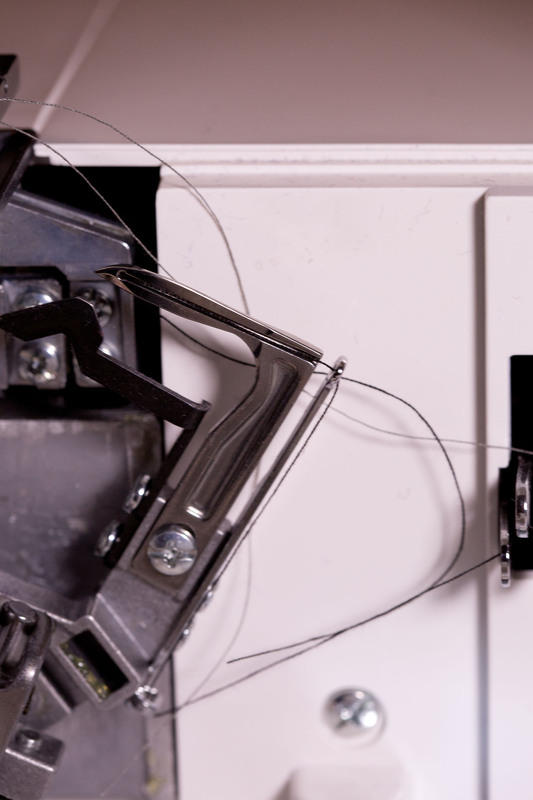 Forget chain stitching, which makes it even easier for threads to become undone. Since everyone raved about Debbie’s tutorial (which is excellent) and I was unable to get satisfactory results, I often wondered if I was mentally deficient. With the Janome, I have been able to raise the needles, clip the threads, and pull them out to the back on the first try with 100% success. (I guess I’m not so mentally deficient after all.) 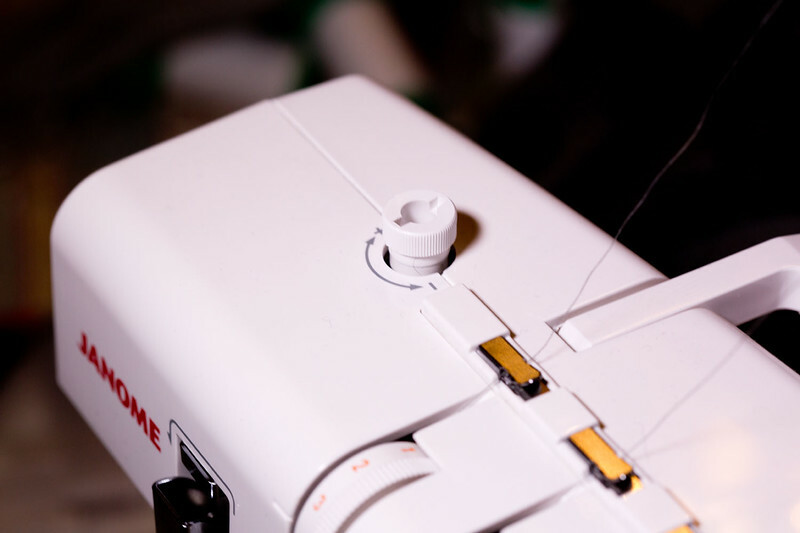 One thing I have noticed with the Janome is that it requires a firm little “snap” motion when it comes time to release the lower looper thread, especially after chain stitching. No limp wristing! This is a tip I picked up in the Janome CoverPro Inspirations YouTube video. I rarely used the chain stitch on my Evolve. In addition to having the ending in the round issue (which is especially problematic with a chain stitch) I also found chain stitching (and sometimes coverstitching) was difficult due to the very small workspace. With the Janome, I’m finding myself using the chain stitch all the time! The large bed makes it much easier to manipulate fabric, and the fact that I can consistently end in the round properly means that I’ll be using the chain stitch much more often for when it comes time to attach bindings. Despite the fact that I’m still waiting on my clear center guide foot to arrive, I was able to topstitch my Kendall top with the regular metal foot with relative accuracy. The one thing I miss about the Evolve is the ability to chain off a coverstitch/chain stitch, or create thread chains using the chain stitch. With the Janome you have to have fabric under the foot for the chaining to work properly. So now when I chain stitch (or coverstitch) from the start to end of a flat piece of fabric I have start and end with a scrap of fabric. So far I’ve sewn two projects on this machine: a couple of pairs of the Style Arc Becki yoga pants using a 4-way stretch fleece, and my Style Arc Kendall tops. 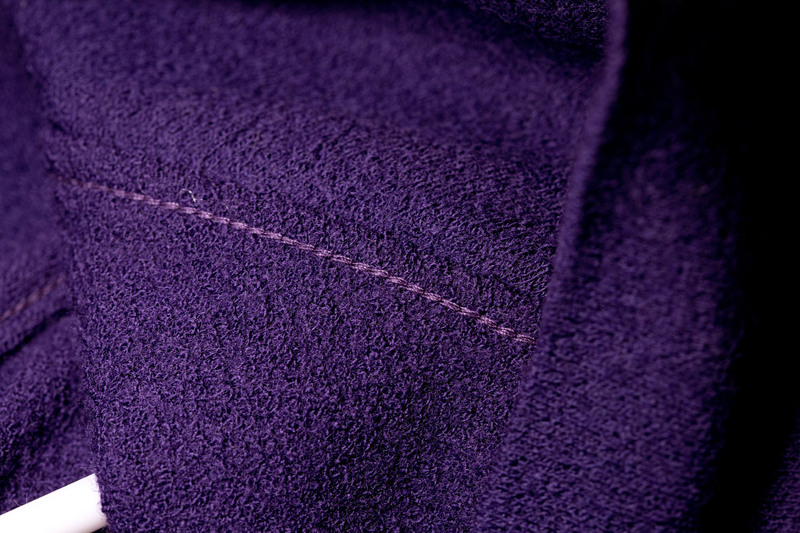 Here’s the chain stitch on the purple Kendall top. I used regular Gutermann sewing machine thread for both the needle and looper. 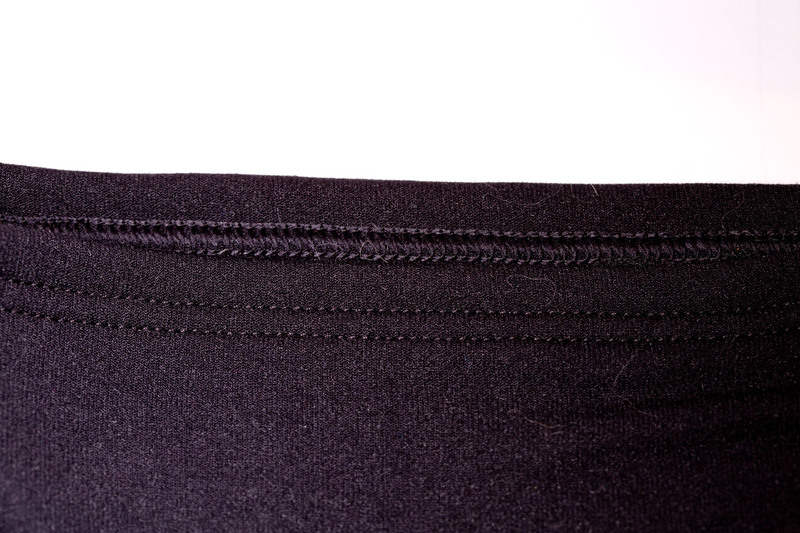 Here’s the coverstitched hem of the fleece yoga pants. (This was actually my first project on this machine.) I used regular Maxi-lock thread for the needles and Maxi-lock stretch/wooly nylon thread for the looper. I’ve sewed up many samples and a few projects on them so far, and I have to say that my dealer did me a huge favor telling me to ditch the Babylock! These two machines surpassed my expectations, especially the 2000CPX. 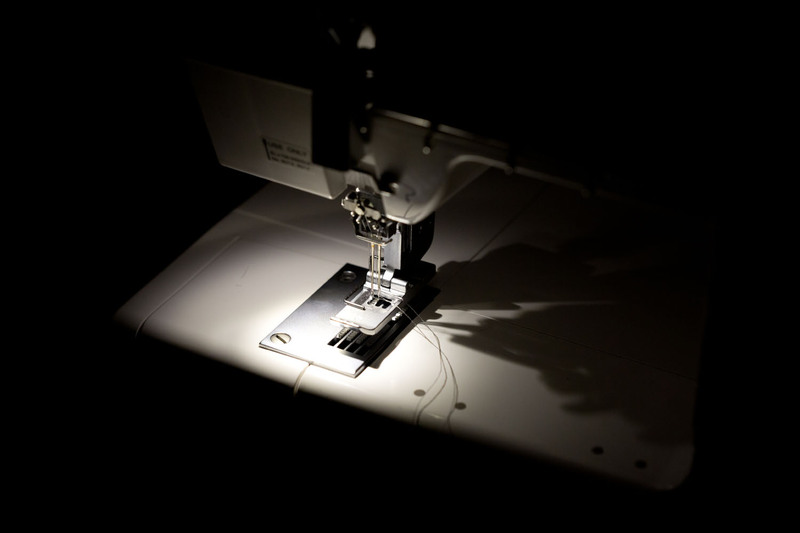 As a brand Janome is one of the best for delivering the most bang for the buck. In case if you’re wondering about price: I purchased the Janome 1100D and 2000CPX for a total pre-tax amount of $1698. My dealer also extended all servicing/warranty work and parts from one to three years. My Babylock Evolve was a floor model that was around $2000 circa 2007, and that price did not include anything other than instruction. Thank you for a very thorough review of both machines. 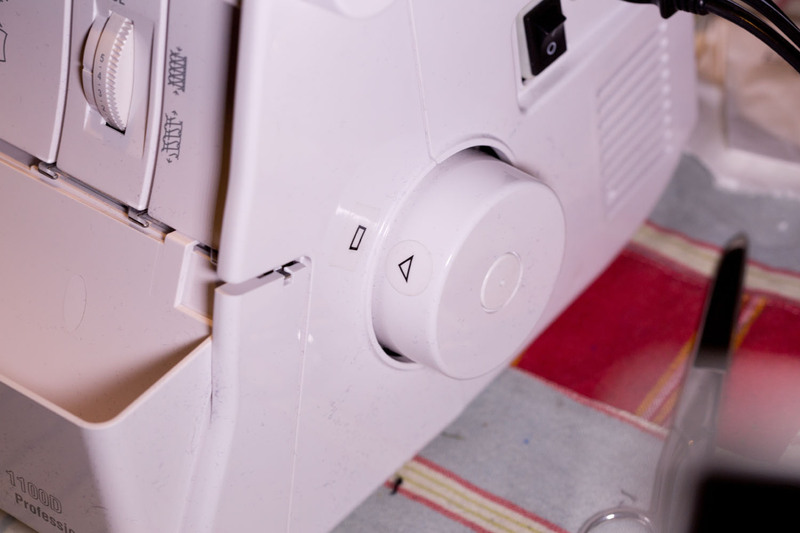 My serger is old, and I know that one day I will have to purchase a new one. Your reviews are very helpful! Thank you, Really appreciate your thorough review. I have owned my Janome Coverpro 1000 for about 5 years. Love it, use it mainly for alterations to knit clothing, shortening sleeves, hems on pants and skirts it gives the professional finish to ready to wear outfits which I can customize to fit well. Just bought myself a CoverPro 2000 and am thoroughly enjoying it. Also ordered a clear foot, which definitely makes the machine more usable. Really this foot should be standard issue, imho. Thanks for the great review! I’m a Janome machine sewist also and I have the 1000CPX. 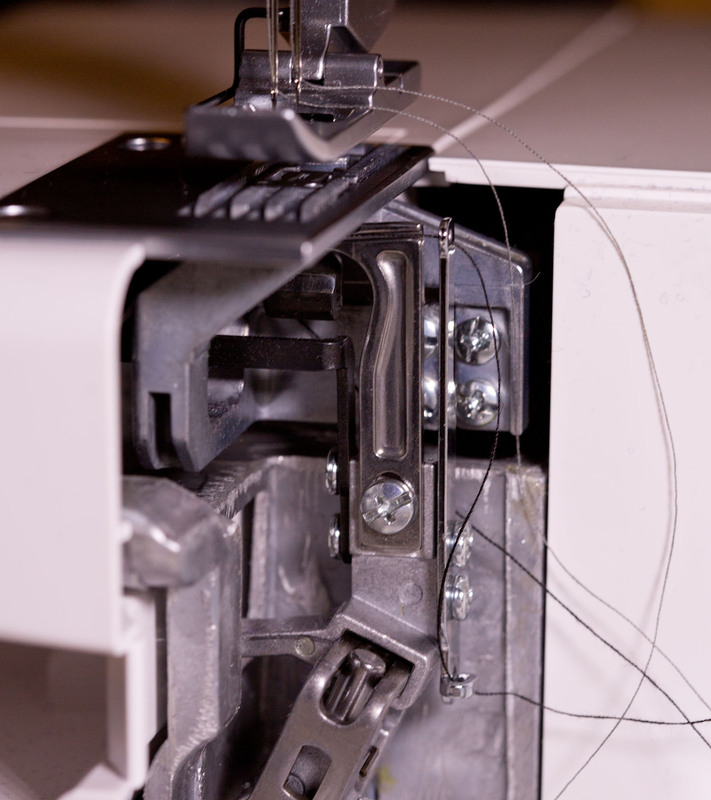 Between that and my Janome 634D serger, it gets pretty intense with the threading and troubleshooting. As long as they’re running and problem free, I’m a happy camper. 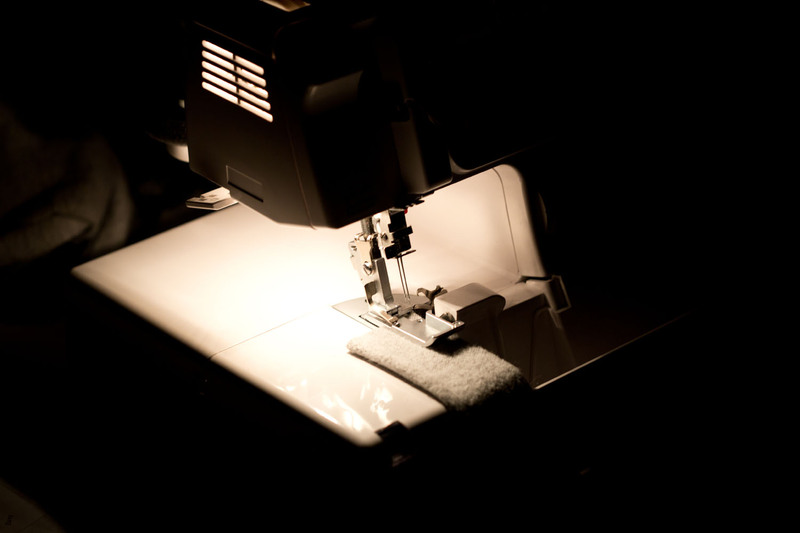 I also have Janome (simple, basic) sewing machines–which I love. Yes, that’s what I mostly care about too. For me it is a tool, not something to wax poetic about! Great reviews. I bought the Coverpro 1000 last year and have also been really happy. You’ll have to keep us apprised of the accessories you buy for your Coverpro; I keep thinking about getting a binding attachment, but they are so pricey and there are multiple, so I’m not sure which to go with! I think you should check out this thread on Stitcher’s Guild, and pay close attention to fzxdoc’s response. Just fixed the link – should work now! I meant to respond long ago! Thanks for the link. I’m pondering buying the smaller Janome branded binder to get the binder plate and then buying some generic eBay binders, but the extension table is also a good idea. Now that it’s been a few months more, how are you liking both machines? Good to hear. 🙂 I have been a little lax with blog reading in the last few months, so it was entirely possible I could have missed such a post! Thank you for such a comprehensive review! I have a Janome sewing machine, coverstitch and serger: models ‘down’ from yours, but I am absolutely delighted with their performance — and reliability over time (I’ve had each for more than 5 years). My sewing colleagues, high-end Bernina and Husqvarna owners, are a little patronising about my Janomes (! ), but my machines have always been trouble free and deliver an excellent outcome. I couldn’t be happier with them, so hope that you have similar enjoyment from your new purchases! Oh I know exactly what you mean! I sometimes wonder if a lot of it is the fact that many people are upgrading from entry level machines, and at that point any higher end machine would have been a whole new world for them. I also think a lot of it is that since they paid a lot of money they’ve made up their mind they’re going to love it no matter what! I have heard that Janome runs their own factory instead of using contractors (like Babylock does), so they have very good quality control. Thank you Anne for such an incredibly detailed review! I am in the market for a new overlocker. I have hated mine ever since I got it – it’s a Janome 774D – to the extent that I had mentally written off all Janomes and was thinking of a Babylock. Your review is making me reconsider. I think that I need to do some more research! Part of the problem for me is that I don’t particularly like my local Janome dealer. I don’t own a coverstitch machine at all, but like you think that two dedicated machines would be preferable to one that converts. So much more to think about! Oh yes, I now believe 100% that separate machines are the way to go, no matter what brand! My main problem with Babylock is that I felt like I paid a premium for a machine that just didn’t have fantastic build quality. In addition to the issue I mentioned in my post some of the plastic yellowed (an infamous Evolve problem) and got brittle, and I also had a problem a few years ago with a seized bearing. Everyone that saw this machine thought it was 15 to 20 years old. If I had paid $1200 or $1300 for it I would have felt differently. Everyone other than me seems to adore their Babylock, so don’t let my bad experience stop you from checking them out! 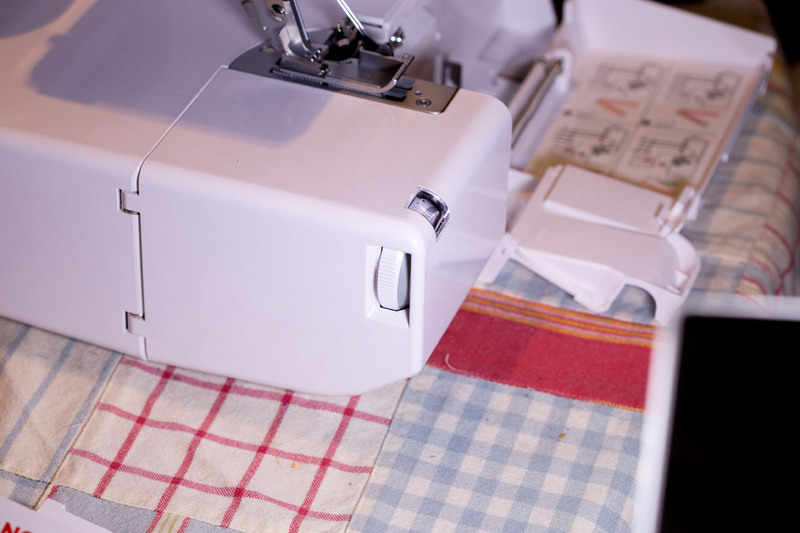 I have had my Janome sewing machine for 18 years and my EzyLock604D overlocker since 2000. If I was planning to get a coverstitch I wouldn’t consider anything else other than a Janome. Your excellent review has simply reinforced my opinion of Janome. Thank you. Even though I don’t like the MyLock 204D’s performance with knits I have to say that it has been a problem-free machine for me. It is almost ten years old, and aside from regularly cleaning out the lint, changing out the blade once, and oiling it just a handful of times (which I have definitely gotten better about in more recent years), I haven’t had to do anything to it. Good to read your reviews. I appreciate that they are considered, genuine and not sponsored. I also appreciate that you tried out all the stitch combinations I would use. I had a five thread Pfaff which I loved and cursed. It died and a friend gifted me an elderly Elna overlocker. It only does three thread and doesn’t have differential feed. Some day I would like to get a decent four thread again. Anything after the Elna will be a dream machine. I love the idea of auto threading and tension. They cause extraordinary stress. BUT – the Babylock is so much more than every other machine on the market! So much more than I’ll ever be able to justify, especially as the difference could be spent on fabric. Guess I’m going to be looking at the Janome machines. This particular Janome serger seems good. I would definitely look into it. You’re right, Babylock sergers are quite pricey. I feel like their business model is outdated and all about exclusivity and protecting the dealers. IMO the Janome 1100D gives pretty much the same sewing experience for less money. The little switch/metal tab that pulls that hook forward does help make threading it easier. Jet air threading comes with its own issues, like the thread sticking to the tubes when humidity is low (and increasing the complexity of the machine). There are some people that still manually thread their Babylock with the wire, despite having the jet air threading at their disposal. I feel like having it didn’t save me much time overall, and I don’t miss it at all. You will absolutely love having auto tension though! I’m glad you love your 2000cpx. I have the 1000cpx, it does have the tighten/loosen back thread adjustment, just located in a different place. What it doesn’t have is the tension release which would be nice but it is easy to get around. 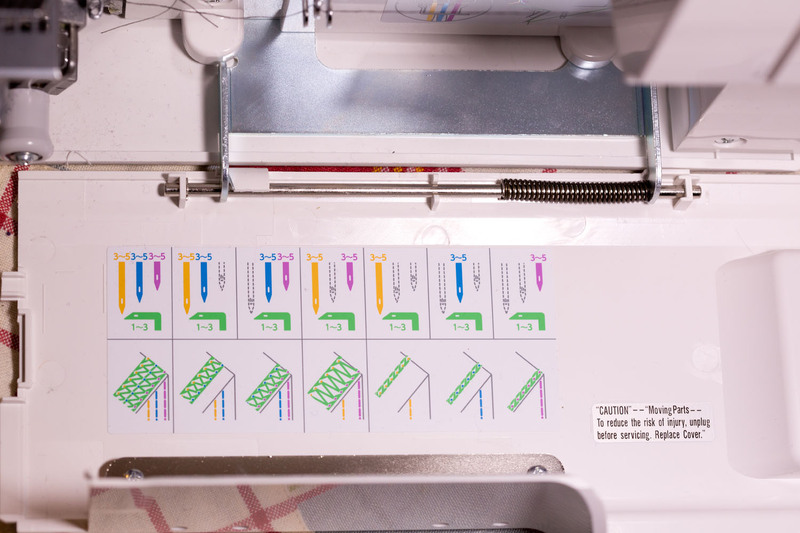 I agree that a dedicated overlocker, dedicated coverstitch is the best option and while I had to wait to get my coverstitch a few years after my overlocker (Bernina 1150MDA) I’m glad I went with separate machines too. They both do excellent jobs on their own. Oops, forgot to add. I find wash-away stabiliser is great for tunnelling, especially for lightweight merino. When I bought my machine the guy told me that you make small adjustments to the differential feed to help with skipped stitches as it is not quite the same as differential feed on an overlocker. 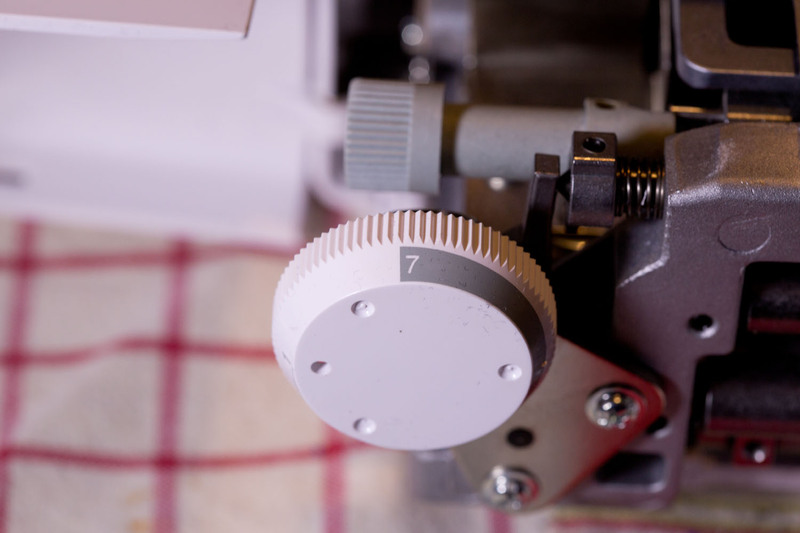 I have to say that I disagree about the differential feed – I’ve found that it works exactly the same on a coverstitch as it does on a serger. It adjusts for stretched/gathered fabric and that’s it. Skipped stitches tend to be more of a needle, tension, or even stitch length problem. I have also found that tunneling is minimized by tweaking the tension. 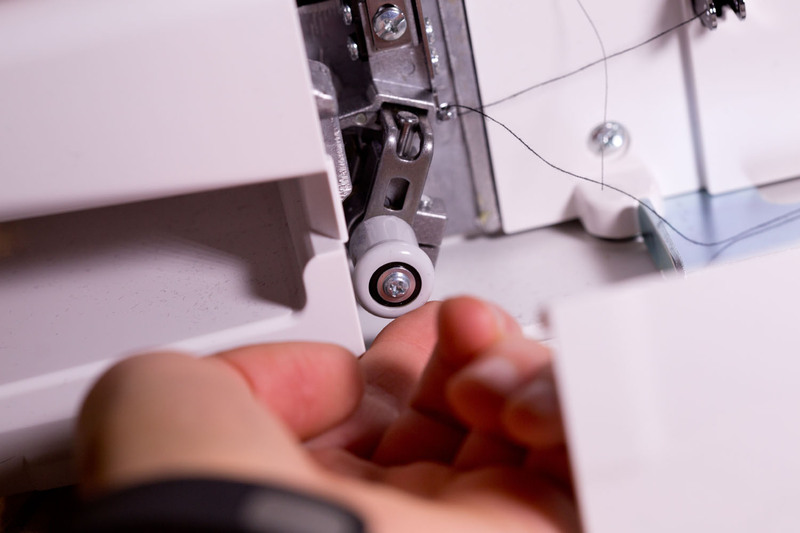 Between the differential feed, adjustable tensions, and adjustable presser foot pressure you shouldn’t need to stabilize before sewing a hem on a coverstitch machine. I did not explain that very well, yes the differential feed works the same as on an overlocker but thinking about its affect on the stitch chain is a bit different as you don’t get skipped/popped stitches on an overlocker. The fabric feed can contribute to skipped stitches, the same way pulling on the fabric can upset the chain/timing. Some merino is very fine, it stretches and recovers differently to other knits , every adjustment possible can still result in some tunnelling, wash away stabiliser to the rescue. Thank you for the wonderful reviews. I purchased the Janome 1000cpx last year for the same reason; converting my old Elna to cover stitch mode took forever and the stitch quality was sub par. The Janome works beautifully and I find myself using it much more than I thought I would. I haven’t bought any of the accessories (clear foot, binding foot, table extension) yet but am considering them. I would be interested in your thoughts. The chain stitch is great for basting as it pulls out so fast. 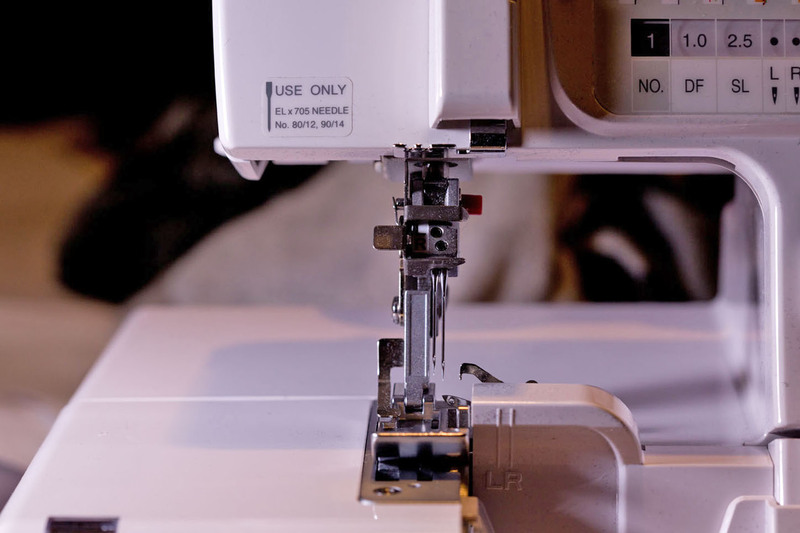 My old serger is ancient and am looking for one which will do tiny rolled hems on sheers. Just curious if you have tried this on your new machine? I’m with you on manual threading. I don’t want to depend on a fancy feature, air threading, which might or might not work. 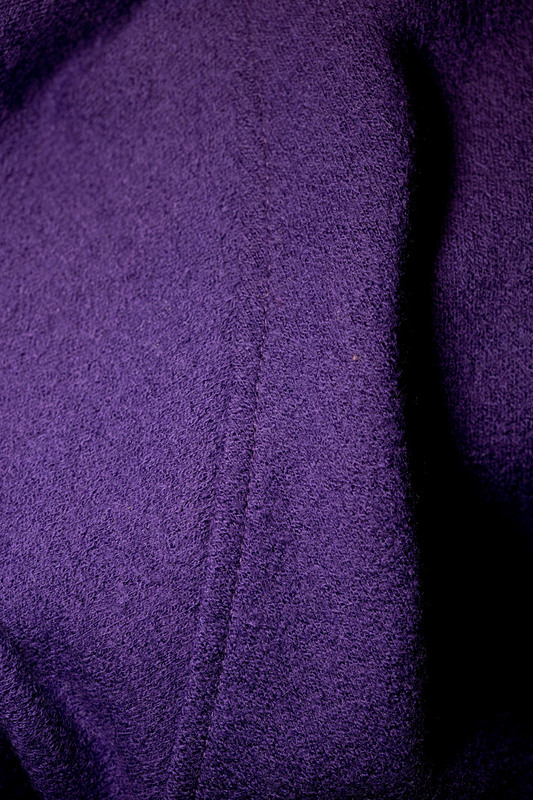 I did a quick sample with a rolled hem, and I didn’t find it much different that the one my Babylock did. I’ve only done serged rolled hems a handful of times over the past decade because I’m just not a big fan of the look. I get that serger rolled hems are quick, but I feel like machine or hand rolled hems are aesthetically more pleasing. I think the primary lesson here is to get dedicated machines for the different functions. 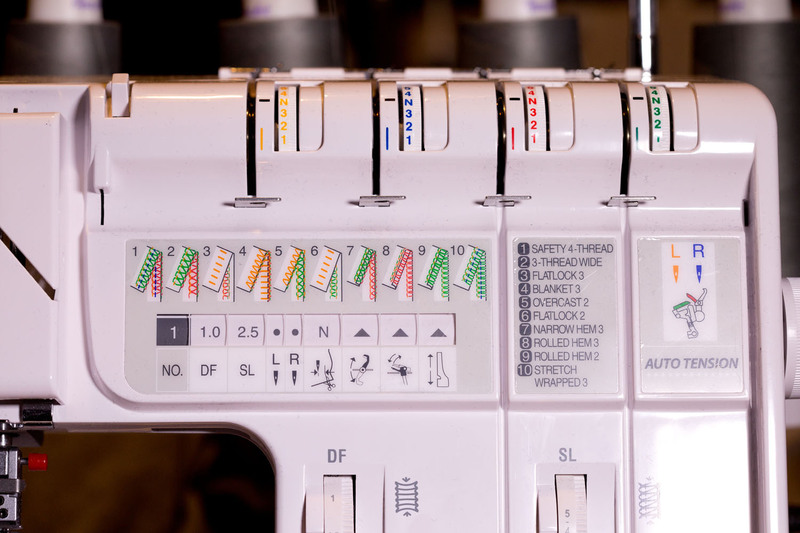 Years ago I ditched a Bernina combo machine for the same reasons you cite with your Babylock combo machine. I replaced that machine with separate Babylock Imagine and Coverstitch machines and have enjoyed all the benefits you mention for separate machines. As you say, a good, local service person is essential. I don’t like my local Janome dealer and would not even consider any of their machines for that reason. So glad you’ve found the machines to make sewing knits fun. I look forward to seeing what comes out of them. Congrats on your purchases! 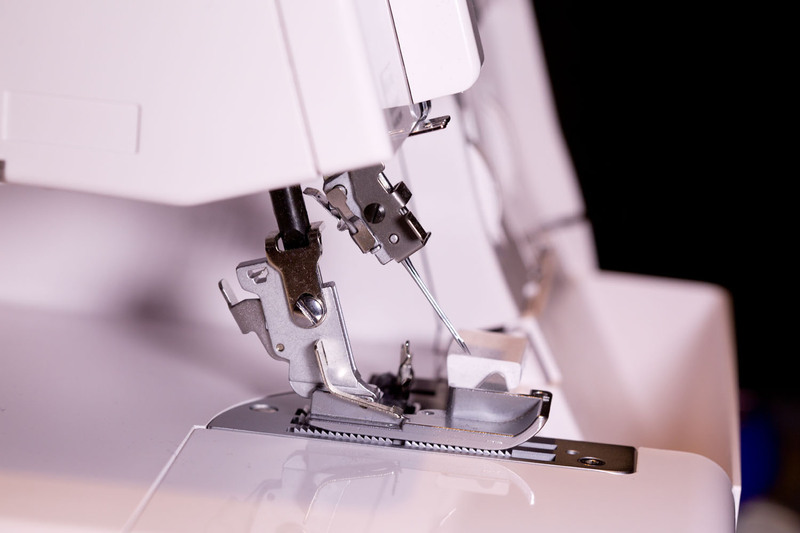 It will make things a lot easier not to have to take the time to switch from serger to coverstitch and vice versa. Unless you plan on keeping 6-8 spools around of the same color thread for every project, I feel like it doesn’t save *that* much time since when you switch between the two you need to re-thread. The experience between this setup and my previous combo machine is very different though. I’m not crazy about the extra room two machines take up, but I’m definitely happier with the performance. Thanks for posting the great review of these machines, Ann. I’m going to pass them on to a friend who is interested in them. I am seriously tempted by the Coverpro! My Evolve is still going strong, and *knock on wood* no repairs to date, purchased mid-2000’s. I probably just jinxed myself! 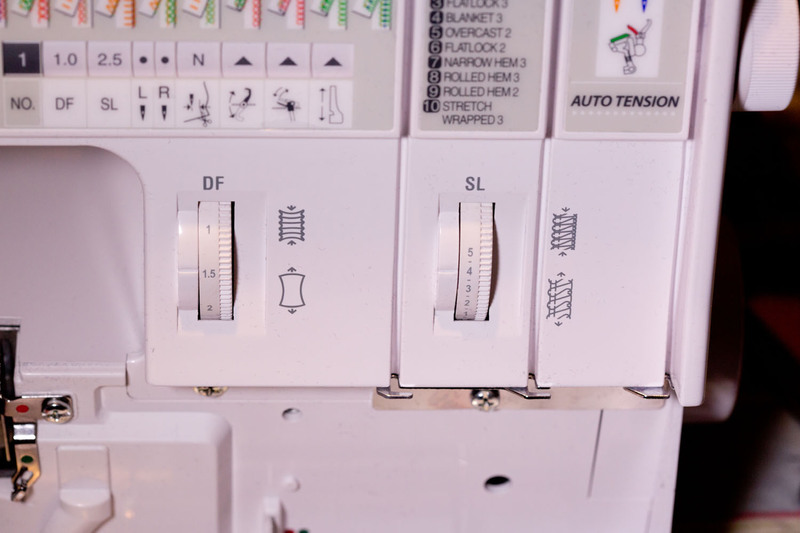 But a Coverpro would be nice to avoid the switching back and forth. Yours will probably be fine – I think my Evolve was just a lemon. Thank you for the detailed review. Now that you have had a few months with your CoverPro, are you still experiencing great results? I haven’t been using it much lately, but no, my feelings on it haven’t changed. I was pretty good about testing the different functions and fabrics when I first got it. Great review. Can I ask you which feet you use the most for the Coverpro ? The only additional foot I bought is the clear guide foot. Thank you so much for this in-depth review and close-up photos! I was on fence about purchasing a cover stitch machine. Your review and the discussion thread of comments helped me greatly. Today I will take my new machine out of the box and play with it!!! Could I please make a couple of adjustments? (sewing pun!) I would like to use a name other than my full name and I would like to change the comment–I goofed and had to make two and it should have been one. Just cleaned up your comments – thanks for stopping by! Glad to be of assistance…good luck! My Huskylock (Husqvarna) S25 broke down earlier this year and I couldn’t imagine life without a serger so off I went to investigate but like you I DEFINTELY didn’t want anything to do with a combo machine. Threading the S25 was never a picnic so I almost never used the coverstitch option! Which was annoying and frustrating. 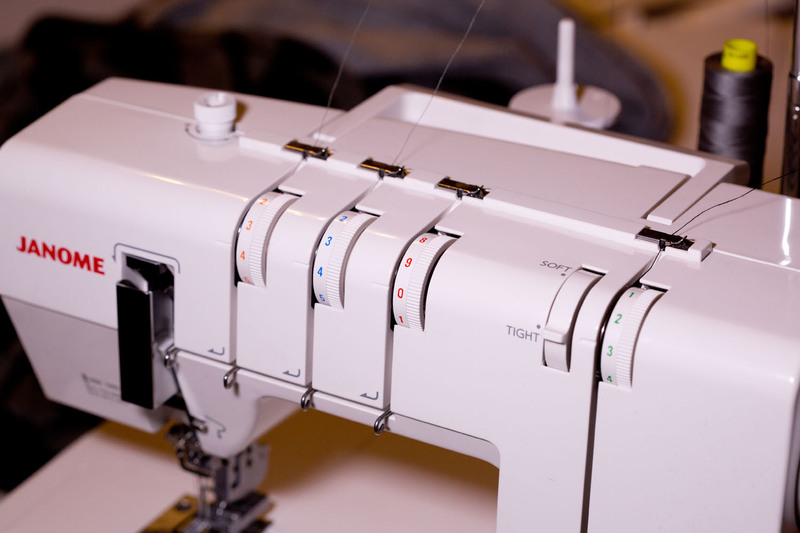 So I bought 2 separate machines as well and because I had really detested the threading of that serger I was determined to get something that was known far and wide for it’s easy threading – Babylock 🙂 I bought both the Imagine and the Coverstitch and love them both to pieces. I could wax poetic on these machines honestly but the cost had me gasping for air. My husband gave up and fainted 🙂 I love Janome. I have an Elna Excellence 740 (almost identical to the Janome 7700) and love it. Janome came out with their new M series this year and that M9400 is amazing. I went to a demonstration at our local dealer last month and ALMOST bought one – 3 women did! Beautiful machine. Thankyou for great in depth info. I have been debating which coverstitch machine to get for a while. I’m saving up for one. I have a very expensive Bernina 780 that I bought myself but really think I should have something less expensive as I just sew garment for kids. 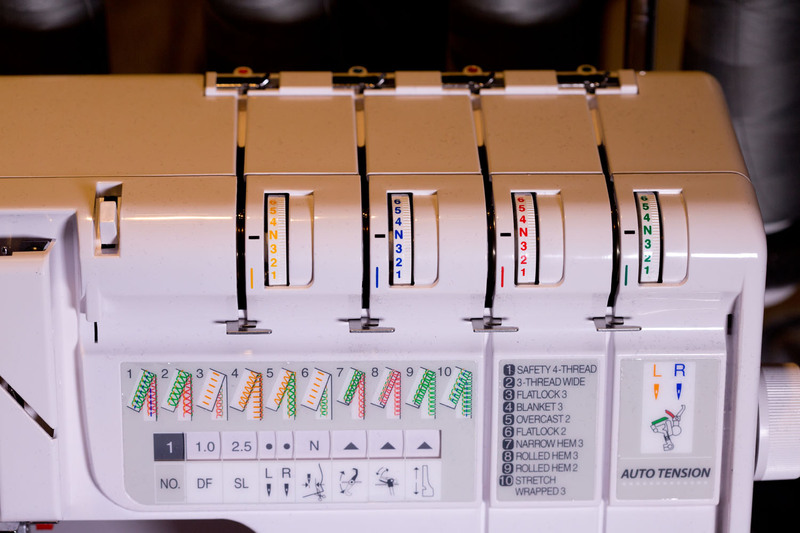 However I love my serger Bernina 1150MDA which is amazing. Did you know on fine fabrics you can use a strip of plastic shopping bag ( for rolled hems Etc) to make it run better and no tunneling. Cheaper than tear away.